Geary Contemporary is pleased to present recent paintings by Federico Cattaneo, an Argentinian-born artist who currently resides in Miami. The exhibition will be on view from September 10 through October 30 with an opening reception on Thursday, September 10 from 6 to 8 p.m. The subject matter in this latest series of works involves the spatial nature of abstraction, specifically the contradiction created by the illusionistic rendering of depth on an inherently flat surface. His overall, sometimes dazzling patterns are laid out in a semi-regular fashion allowing geometry and gesture to find an uneasy synthesis of order and spontaneity. 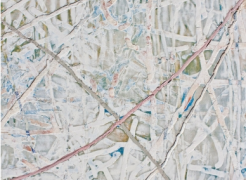 The artist uses found wood or fabric as a work surface providing him with ready-made motifs—the grain of the wood veneer or the decorative patterns of the printed linen or silk—to which he responds with a swathe of approaches that suggest a layering of depths and dimensional “disconnects”. Areas that seem to be the background make a sudden visual jump to the foreground. His generally all-over compositions contain both painterly gestures—sometimes thick in application, sometimes like translucent washes—and irregularly looping lines of a graphic nature that he carves into the surface. 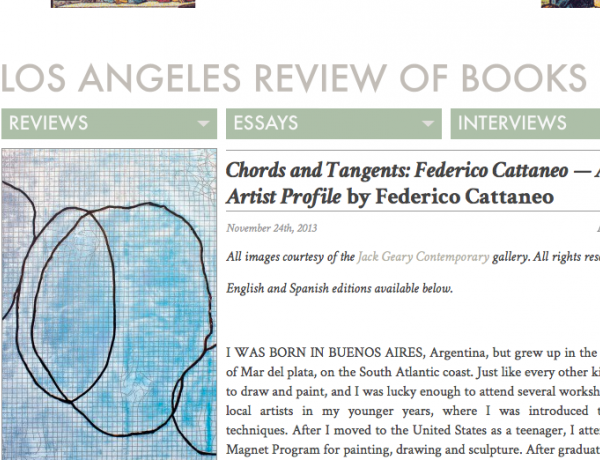 Cattaneo uses paint to fill-in the resulting furrows and the resulting graphic mark can appear as the painting’s uppermost layer boldly breaking the membrane of the two-dimensional support. Incising the surface in such a slow, deliberate way brings to mind the work of another artist of Argentinian descent, namely Lucio Fontana who completely punctured the canvas of two series of paintings, either with holes (Buchi, begun 1949) or more menacing slashes (Tagli, begun 1955) which, in revealing the actual space behind the work, effectively blurs the distinction between two- and three-dimensionality. Fontana’s was a more metaphysical quest, an attempt to create a new kind of art that would resolve his fascinations with the virtual world of art and the technological world of the Space Age in the early 1950s. But the comparison serves to highlight the degree of dedication Cattaneo has to the spatial contradictions and perceptual ambiguities that can be discovered and debated on a painted surface while remaining attentive to its relationship with the viewer. Sometimes Cattaneo will use gridded lines as a visual tether to the underlying motifs, but subverts any associations the grid has with Minimalism’s austerity by having patches gently unfurl and, in doing so, emphasizes the act of looking by redirecting the viewer’s gaze from the surface plane (an exterior view) to through and beyond the surface (an interior view). 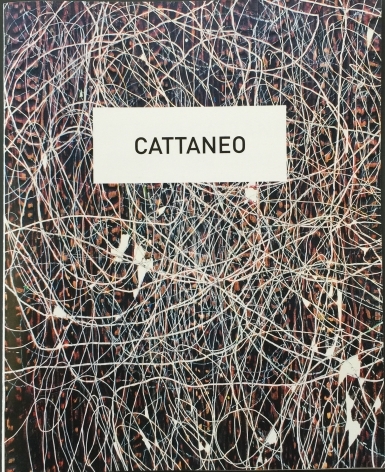 Like many other contemporary practitioners of the genre, Cattaneo has fully absorbed and builds upon a host of historical precedents all the while proving that seemingly antithetical impulses—gesture and geometry, depth and flatness, interiority and exteriority, abstraction and representation—can co-exist within the same painting. His most recent body of work contributes to the vitality of a discussion, now well over 100 years old, about the fundamental questions and decisions that are at the very heart of painting.